The Taco Bell Crunchwrap is a fantastic Taco Bell Menu item, it combined a tostada, and a burrito all in one. You can make this at home, it isn’t hard to do at all. I love the creative nature of Taco Bell. 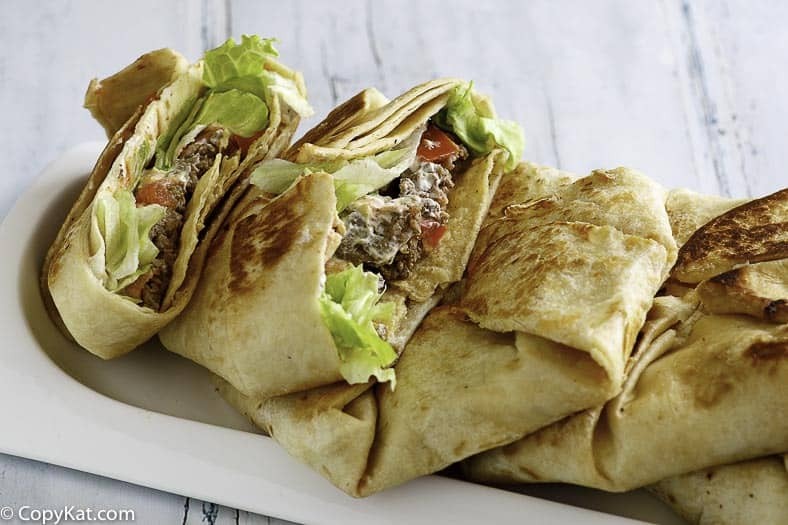 In fact, years ago when I was getting my MBA, I wrote about them and how they do a fantastic job of reinventing a few core ingredients into new menu items such as their crunchwraps. This recipe is for their Taco Bell Crunchwrap Supreme. Here we have their seasoned beef, cheese, sauce, lettuce, sour cream, and beans (if you desire), and a crispy corn shell inside of a toasted tortilla. It’s not that complicated to make. You will need a hard-crunch corn tortilla (or you could use a leftover taco shell or two – broken in half) for the crispy inside. I buy the large burrito tortillas for the outside when I make them. His name was Glen Bell, and the story begins with his hot dog stand named Bell’s Drive-In, which he opened in San Bernardino, California in 1946 at the age of twenty-three. Four years after this, he progressed to a hamburger stand – Bell’s Hamburgers and Hot Dogs situated in a Latino neighborhood. He couldn’t help but be impressed by the long lines across the street outside a Mexican restaurant – people were waiting on line for the restaurant’s hard-shelled tacos. Bell dined there frequently, and the owners showed him how the tacos were made. By early 1952, he knew enough about making tacos to open a taco stand of his own, which he named Taco-Tia. Bell eventually owned several taco stands, and in 1962 he sold them all and opened the very first Taco Bell in Downey, California. In the space of two years he sold his very first franchise, and by 1967 one hundred Taco Bells were up and running. The rest, as the saying goes, is history – the number of Taco Bells now stands at over 7,000! 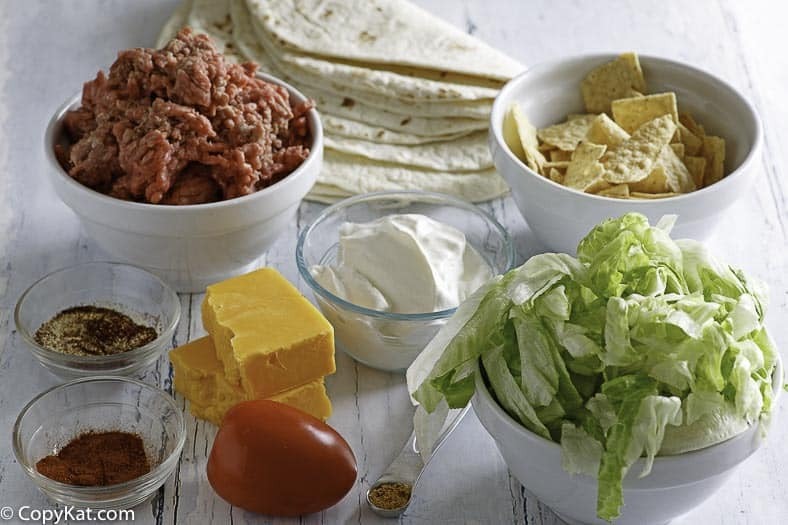 Ingredients you will need to make the Taco Bell Crunchwrap at home. The Taco Bell Crunchwrap is a fantastic Taco Bell menu item. It combines a tostada and a burrito all in one. And, what’s even better, you can easily make this at home. It isn’t hard to do at all. First, you will make the seasoned taco meat mixture and, if you want, some of my homemade Taco Bell sauce – click here for the sauce recipe. 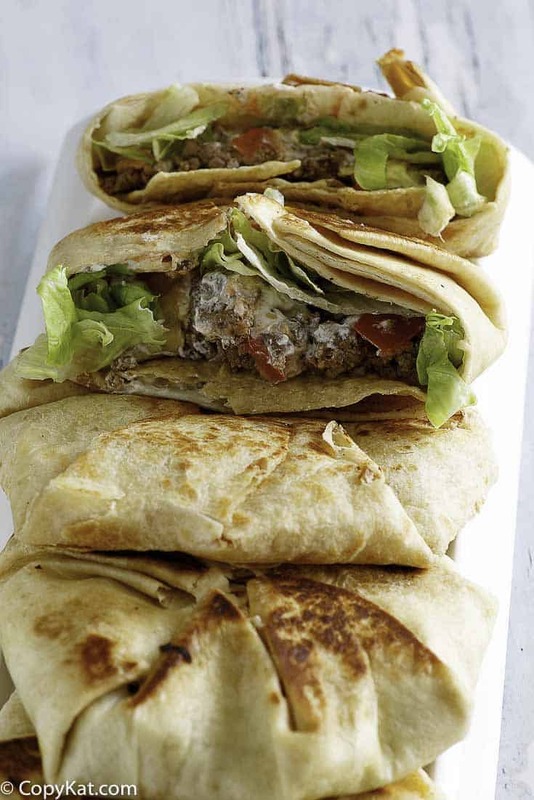 You will assemble your wrap and toast the tortilla in a frying pan for a minute or two on each side, And, ta-da! Your very own homemade Taco Bell Crunchwrap. Delish! Here’s a helpful video showing you how to fold your wrap just like they do at Taco Bell. You can make a Taco Bell Crunch Wrap at home! Beef directions: Mix together all the ingredients except the meat. Stir the spice mix well to make sure that all spices have been blended well. Crumble the ground beef into a large skillet (preferably nonstick) and brown, stirring well. Remove from the heat. Dump the meat into a strainer in the sink, rinse with hot water, and drain off the water and grease from the beef. Return the beef to the pan. Stir in the spice mix and 3/4 to 1 cup water. Simmer on medium-low heat for 20 minutes, until most of the moisture has cooked away. Remove from heat before the meat is completely dry. if you can't get a hexagon during the first few efforts do not worry, as long as the insides are completely enclosed it will still taste the same. Brown for about 60 seconds on each side or until the tortilla begins to brown. holy crap these were delish. I read the comments first and decided to add some queso – but I followed the rest of the recipe exactly how she said and they were PERFECT. Also if you use a 12 in. tortilla it is much easier to wrap, and the tostada shell fits easily. I love sour cream in this too! It works for breakfast as well. Use scrambled eggs, favorite breakfast meat, and cheese. Also, crushed Doritos can be used. Nacho cheese or ranch flavored can be used for a little extra flavor. Great idea on the doritos. I just made these the fast and lazy way, but they were awesome! So fast and easy! I just used a pack of Taco Bell seasoning mix. I layered it just like the picture (make sure you break up the corn tortilla). I ended with cheese so the folds would stay together. Used 2 pancake turners to flip it. Only took about 2 min to brown and melt the cheese inside. Topped it with salsa. It was WONDERFUL!!!!!! I cannot WAIT to try this at home. I am such a SUCKER for the Crunchwrap! thank you Stephanie! Get the Jumbo shells at the Deli area. This is one of my family’s favorite meals. I do chopped chicken breast, nacho cheese, cheddar cheese, Don Pedro crunchy tostada shells, lettuce, onions, tomatoes. Basically anything that you would put in a taco. I use my George Foreman grill to grill both sides at once. okay 1) you gotta have nacho cheese sauce for the cruchwrap to taste authentic. Also to really make it taste like Taco Bell put your ground beef in a food processor for a few seconds. Instead of taco seasoning I use Taco Bell’s mild sauce for the beef and a little in the cheese sauce and it is spot on Taco Bell’s Crunchwrap! Carly, I really appreciate all of your insight! Thank you. Sorry but this recipe was awful. The meat was bland and there is no way a whole tostada fits in the middle of a wrapped up burrito tortilla. I had to use 2 tortillas to keep all the inside ingredients inside. Also the edges of the tortilla didnt want to stay folded. Horrible recipe and even though we made it work with 2 tortillas, they fell apart while being eaten. I had high hopes for this recipe. I will search for a different one to compare. Thank you for letting me know how you feel. I am sorry you did not enjoy the recipe. You do have to break the tostada in half to make it fit. They come larger than tortillas can handle. This will be the same for any recipe you try. Again, I am sorry you did not enjoy the recipe. i’ve made this recipe three times now and have perfected it!! i shouldnt have left such an awful review but honestly it was really bad the first time i made them!! i’m now a pro and ive used a few different taco seasoning recipes to get the taste right. what i still dont understand is, i watched a youtube video of this same copy cat style recipe and the guy put a whole corn tortilla inside a burrito size tortilla. NOT ONCE HAVE I EVER GOTTEN ANY WHOLE TORTILLA OR TOSTADA to fit inside a burrito size tortilla. i end up having to cut the edges of the corn tortilla off to get it to fit inside. thanks for the recipe, i still havent tried the actual crunchwrap from taco bell!!! I have not used this particular recipe since I have already had my own for the Crunch-wrap but there are a few supermarkets that actually sell extra large tortillas. They usually come in around a 4 pack and are mostly found around the deli area since they are used for wraps. These work best for fitting the whole tostada shell inside. Good to know. I’ll have to be on the look out for those. I personally fell in love with the tortillas you cook, they are so fresh and wonderful. 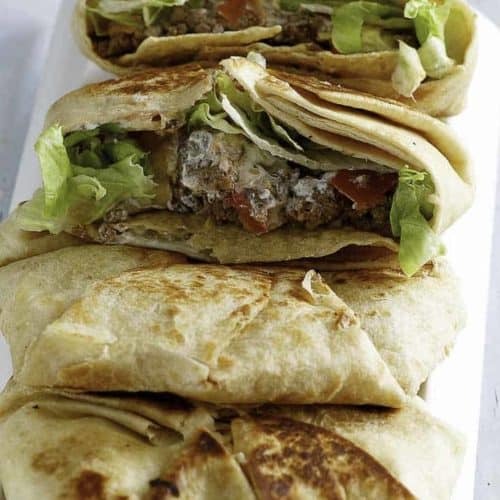 Before folding up the CRS, take a smaller piece of flour tortilla and top the veggies, then fold. That keeps the top closed up. I live and die by mission shells…use them for my quesadilla maker and they fit perfect! Taco bell does not use a dry meat, they use a wet mixture. Instead of the water add 1/2 cup tomato sauce, 1/2 cup chicken broth and 4 tsp apple cider vinegar to the mix. I also find it easier to just use a store bought spice mix than to create your own at times. Just perhaps a few thoughts to consider. That sounds interesting, I want to give your recipe a try soon. You are a saint. Thank you for keeping your cool with some rude comments. This looks delicious and I am making it today. Firstly, it sounds like you put too much filler on the inside. Secondly, she showed in the video that the tostada (taco shell) was broken to fit inside. Thirdly, the sides of the tortilla cannot come apart if you put it in the pan, folded side down first. The recipe is good. Your ability to follow directions is not. I use a biscuit cutter to make a small circle and put that in the middle before wrapping up the burrito size tortilla and it totally works and it does stay together. I hope you give this recipe a try. This is so awesome!!!!!!!!!!!!!!!!!!!!!!!!!!!!!! (gasp gasp)!!!!!!!!!!!!!!!!!!!!!!!!!!!!!!!!!!!!!!!!!! !